Come along to a beach clean with a difference. As well as doing some good, this event (organised by our friend Khaireen Ellyna) will include a beach labyrinth, before we gather inside for some chatting, sharing, Malaysian cooking and dancing! Find out more about the beach clean event, here. 6 April 11am-4pm, Strong Communities - it's as easy as ABCD! Want to know more about Asset-Based Community Development (ABCD) and how it works in reality? Join us to explore the theory and practice of ABCD, meet and connect with community projects and individuals, and leave knowing how it can transform communities.You can sign up here. Sometimes we need a lot of funding, but sometimes we only need a bit to tide us over, or try something out. There are lots of ways to find financial support which doesn’t involve funding bids, so come and share your ideas and learn from others at this free online workshop. How can bunting bring people together? We’ll show you! 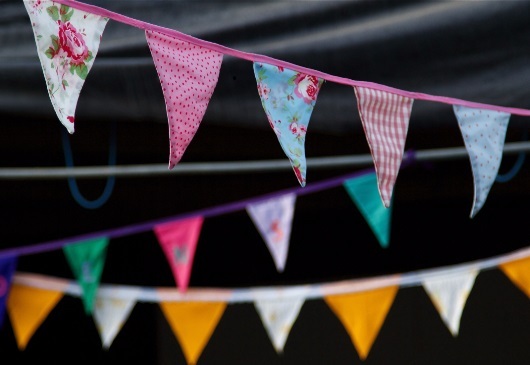 This event combines a bunting making workshop, with an opportunity to network with other community groups and like-minded individuals from Llanelli. It is being organised by our friends in Llanelli, so head to the Facebook page for more info. Over April, we’ll be travelling the UK with our fun Big Lunch exhibition, sharing examples of Big Lunches from across the country. We’ll be popping up at Cardiff’s St David's shopping centre on Weds 17 April - come have a gander and chat to us. We know the story, you’re looking for a little bit of funding for your local project or community group, you come across a fund that seems made for you, only to discover you have to be a registered charity, have to do a 50 page application and minimum grant is £50k! Well now, Third Sector Support Wales have set up a new search platform to help you find funds that suit you, your group, or project. Give it a go, and let us know if you find any interesting opportunities. Can we lend a hand with your Big Lunch? As we build up to The Big Lunch on the first weekend of June 2019, we will once again be setting off on a walk around Wales to meet amazing people who are doing fab things in their communities. But this year, we’re keen to lend a helping hand. Whether that means helping cleaning up a space before the big day, preparing some decorations with you, or giving you a hand in knocking on neighbours’ doors to get them involved, let us know how we can help bring your Big Lunch together. Whether you’ve held a Big Lunch before, or are thinking about holding your first event this year, get in touch with Lowri on 07801 227288 or ljenkins@edenproject.com. 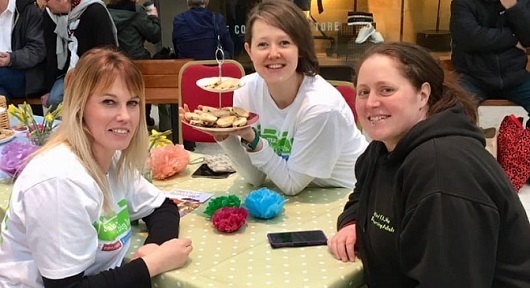 At the beginning of March we were welcomed to the Quadrant shopping centre to speak to Swansea folk about The Big Lunch. After lots of chatting, crafting and 300 Welsh cakes later, we can’t wait to see community events popping up all over Swansea come June. Get in touch if you’re making plans! And a huge thanks to the Quadrant Centre for hosting us for free.